In the equation above, and refer to the frequencies of the longitudinal and transverse optical phonons respectively. and refer to the static and high frequency (above the phonon frequencies, but below any electronic energy scale) dielectric constants. All these quantities are understood to be the values in the long-wavelength limit (i.e. ). 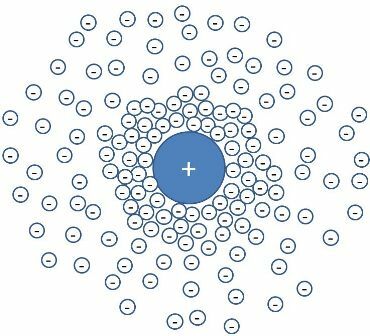 The beautiful thing about the LST result is that it is independent of any microscopic description, which is quite unusual in solid-state physics. Therefore, the result can be derived from classical electrodynamics, without resorting to any quantum mechanics. It is an interesting question as to whether or not quantum mechanics plays a role in the long-wavelength optical response in general. where is a constant. This form of the dielectric constant can be arrived at using either classical electrodynamics or quantum mechanics (see e.g. Ashcroft and Mermin, Kittel or Ziman). Looking at the equation for the dielectric constant from earlier, this is precisely the LST relation! In effect, the same extra restoring due to the long-range Coulomb interaction leads to the extra screening in the static limit, yielding, in my mind, a delightful little result. Using the LST relation, we can deduce a property of ferroelectric materials. Namely, we know that at the transition temperature between the normal state and a ferroelectric ground state, the static dielectric constant, , diverges. Therefore, we can surmise from the LST relation that a zone center transverse optical phonon must go to zero energy (soften) at the transition temperature (see here for PbTiO3). This is a totally non-trivial consequence of the LST relation, demonstrating again its far-reaching utility. Did I mention that I think this result is pretty excellent? I’d like to acknowledge Zhanybek Alpichshev for enlightening some aspects regarding this topic. In regards to the posts I’ve made about plasmons in the past (see here and here for instance), it seems like the plasmon in a metal will always exist at a finite energy at due to the long-ranged nature of the Coulomb interaction. Back in 1956, D. Pines published a paper, where in collaboration with P. Nozieres, he proposed a method by which an acoustic plasmon could indeed exist. The idea is actually quite simple from a conceptual standpoint, so a cartoony description should suffice in describing how this is possible. 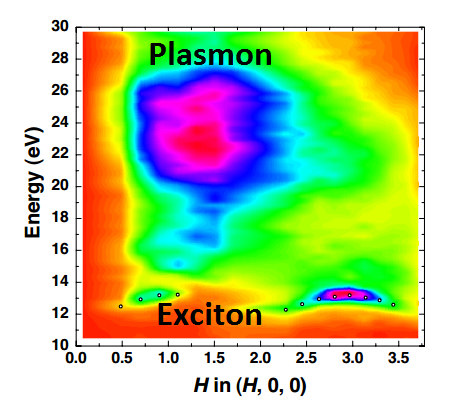 The first important ingredient in realizing an acoustic plasmon is two types of charge carriers. Pines, in his original paper, chose -electrons and -electrons from two separate bands to illustrate his point. However, electrons from one band and holes from another could also suffice. The second important ingredient in realizing the acoustic plasmon is that the masses of the two types of carriers must be very different (which is why Pines chose light -electrons and heavy -electrons). So why are these two features necessary? Well, simply put, the light charge carriers can screen the heavy charge carriers, effectively reducing the range of the Coulomb interaction (see image above). Such a phenomenon is very familiar to all of us who study solids. If, for instance, the interaction between the ions on the lattice sites in a simple 3D monatomic solid were not screened by the electrons, the longitudinal acoustic phonon would necessarily be gapped because of the Coulomb interaction (forgetting, for the moment, about what the lack of charge neutrality would do to the solid!). In some sense, therefore, the longitudinal acoustic phonon is indeed such an acoustic plasmon. The ion acoustic wave in a classical plasma is similarly a manifestation of an acoustic plasmon. This isn’t necessarily the kind of acoustic plasmon that has been so elusive to solid-state physicists, though. The original proposal and the subsequent search was conducted on systems where light electrons (or holes) would screen heavy electrons (or holes). Indeed, it was suspected that Landau damping into the particle-hole continuum was preventing the acoustic plasmon from being an observable excitation in a solid. However, there have been a few papers suggesting that the acoustic plasmon has indeed been observed at solid surfaces. Here is one paper from 2007 claiming that an acoustic plasmon exists on the surface of beryllium and here is another showing a similar phenomenon on the surface of gold. To my knowledge, it is still an open question as to whether such a plasmon can exist in the bulk of a 3D solid. This has not stopped researchers from suggesting that electron-acoustic plasmon coupling could lead to the formation of Cooper pairs and superconductvity in the cuprates. Varma has suggested that a good place to look would be in mixed-valence compounds, where -electron masses can get very heavy. A helpful picture: If one imagines light electrons and heavy holes in a compensated semimetal for instance, the in-phase motion of the electrons and holes would result in an acoustic plasmon while the out-of-phase motion would result in the gapped plasmon. In condensed matter physics, it is easy to get lost in the details of one’s day-to-day work. It is important to sometimes take the time to reflect upon what you’ve done and learned and think about what it all means. In this spirit, below is a list of some of the most important ideas related to condensed matter physics that I picked up during my time as an undergraduate and graduate student. This is of course personal, and I hope that in time I will add to the list. The first two items on the list are well-explained in Forster’s Hydrodynamics, Fluctuations, Broken Symmetry and Correlation Functions without the use of Green’s functions and other advanced theoretical techniques. Although not yet a condensed matter phenomenon, Bell’s theorem and non-locality rank among the most startling consequences of quantum mechanics that I learned in graduate school. I suspect that its influence will be observed in a condensed matter setting in due time. Please feel free to share your own ideas or concepts you would add to the list. The plasma frequency in the study of solids arises in many different contexts. One of the most illuminating ways to look at the plasma frequency is as a measure of the screening response time in solids. I’ve discussed this previously in reference to the screening of longitudinal phonons in semiconductors, but I think it is worth repeating and expanding upon. Now, suppose I introduce a time-varying electric field perturbation into the solid that has angular frequency . The question then arises, will the electrons in the solid be able to respond fast enough to be able to screen this field? Well, for frequencies the corresponding perturbation variation time is . This means the the perturbation variation time is longer than the time it takes for the electrons in the solid to screen the perturbation. So the electrons have no problem screening this field. However, if and , the electronic plasma in the solid will not have enough time to screen out the time-varying electric field. One can see that below the plasma edge at ~15eV, the reflectivity is almost perfect, resulting in the shiny and reflective quality of aluminum metal in the visible range. However, above =15eV, the reflectivity suddenly drops and light is able to pass through the solid virtually unimpeded as the electrons can no longer respond to the quickly varying electric field. Now that one can see the effect of the screening time on an external electric field such as light, the question naturally arises as to how the electrons screen the electric field generated from other electrons in the solid. It turns out that much of what I have discussed above also works for the electrons in the solid self-consistently. Therefore, it turns out that the electrons near the Fermi energy also have their electric fields, by and large, screened out in a similar manner. The distance over which the electric field falls by is usually called the Thomas-Fermi screening length, which for most metals is about half a Bohr radius. That the Thomas-Fermi approximation works well is because one effectively assumes that , which is not a bad approximation for the low-energy effects in solids considering that the plasma frequency is often 10s of eV. Ultimately, the fact that the low-energy electrons near the Fermi energy are well-screened by other electrons self-consistently permits one to use the independent electron approximation — the foundation upon which band theory is built. Therefore, in many instances that the independent electron approximation is used to describe physical phenomena in solids, it should be kept in mind the hidden role the plasmon actually plays in allowing these ideas to work. For example, this is the Coulomb interaction felt between an electron and hole when an exciton is formed (with opposite sign), as can be seen for LiF in the above image. Most studies on strongly correlated electron systems tend to concentrate on low-energy phenomenology. While this is no doubt important, in light of this post, I think it may be worth looking up from time to time as well. In the lead up to the full formulation of BCS theory, the derivation of Bardeen-Pines interaction played a prominent role. The Bardeen-Pines interaction demonstrated that a net attractive interaction between electrons in an electron gas/liquid can result in the presence of phonons. The crucial aspect of this equation is that for frequencies less than the phonon frequency (i.e. for ), the effective interaction becomes negative (i.e. attractive). It was also shown by Kohn and Luttinger in 1965 that, in principle, one could also obtain superconductivity in the absence of phonons. The attraction would occur using the phenomenon of Friedel oscillations whereby the effective potential can also become negative. This was quite a remarkable result: it showed that a purely electronic form of superconductivity was indeed theoretically possible. What makes the effective interaction become attractive in these two models? In the Bardeen-Pines case, the phonons screen the electrons leading to a net attraction, while in the Kohn-Luttinger case, Fermi surface effects can again lead to a net attraction. It is important to note that in both papers, the pre-eminent quantity calculated was the dielectric function. In the aforementioned cases, net attraction resulted when . This raises an interesting question: is it possible to still form Cooper pairs even when ? It is possible that this question has been asked and answered in the literature previously, unbeknownst to me. I do think it is an important point to try to address especially in the context of high temperature superconductivity. I welcome comments regarding this question. Update: In light of my previous post about spin fluctuations, it seems like is not a necessary condition to form Cooper pairs. In the s-wave channel, it seems like, barring some pathology, that would have to be less than , but in the d-wave case, this need not be so. I just hadn’t put two and two together when initially drafting this post.